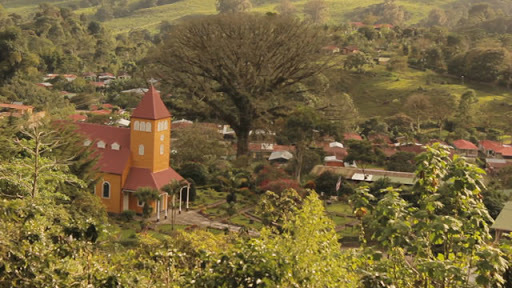 The coffee farm and the community are one in Aquiares, both are dependent on each other. 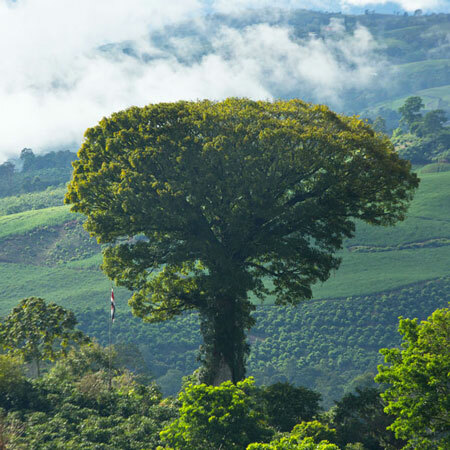 Aquiares, one of Costa Rica’s most historic coffee farms, sits high on the slopes of the Turrialba Volcano. The largest coffee farm in Costa Rica, Aquiares devotes 80% of its land to growing high quality coffee and the remaining 20% to conservation. Coffee plots are interlaced with over a dozen natural springs and almost 20 kilometers in streams, all protected with buffer zones in line with our Rainforest Alliance certification. These streams form a network of natural corridors through the farm that connect the large protected forests in the two river valleys, providing a healthy environment for the local animals, birds, and plants. The farm is nestled between the Aquiares and Turrialba Rivers. It is for this reason that 'Aquiares' means 'land between rivers' in the Huetar indigenous language. The slopes of the Turrialba Volcano were once an important center for this pre-Columbian civilization, which is considered to be the most developed of pre-Columbian Costa Rica. Guayabo National Monument, Costa Rica´s most important indigenous settlement, is just 5 km away. Petroglyphs found in the farm show that a settlement existed in Aquiares, and indigenous artifacts are still found among the coffee trees. These carved rocks tell stories and depict a much different time in our history. Nonetheless, the land between rivers has forever served as a fertile ground for agriculture to strive. Abundant rain and rich volcanic soil once provided for the Huetar to grow cacao and cassava, and now to us “Aquiareños” for our coffee. In 1890, Aquiares was founded by farmers looking to take advantage of Costa Rica´s railroad to the port of Limón. The farm built its own mill, focusing on the washed-coffee processes that are indicative of Costa Rican coffee. Soon, the quality of Aquiares' coffee won it loyal clients in Europe, the United States and Japan. In the early 1900's the English Lindo family acquired the farm. One of the first things they did (in 1925) was import an aluminum church from Belgium and specially order its stained glass windows from Italy. To this day, the church remains the heart of the Aquiares community. In 1949, the farm was bought by the Figueres family. This was the family of Pepe Figueres, the ex-president who abolished the Costa Rican Army. This famous family continued to develop and expand the farm until the early 1970s when three closely-knit families assumed ownership. The community of Aquiares sits in the midst of the farm and is home to almost 2,000 people. The town boasts a century-old primary school, a youth sports program, a recycling committee, an early childhood nutrition center, and a church built in 1925, which is a National Architectural Historic Monument. In the 1990s, the farm began a campaign to improve home ownership in the local community. Each worker was given a bonus for their years of service and the farm gave assistance to people applying for government loans. Today 96% of the Aquiares employees own their own houses. The farm and the community are mutually connected. The farm provides services, land, security and honest jobs. In return, the coffee farm has benefited from a well-educated community and relies on highly skilled professionals from its community to continue functioning. Such a level of interdependence has helped contribute to the sense of pride that Aquiareños take in both our community and our coffee.